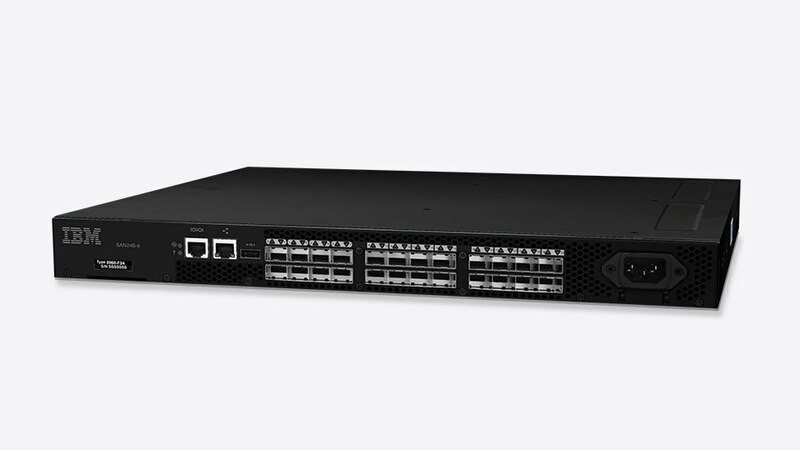 IBM Storage Networking SAN24B-6 is an entry-level switch that combines high-performance capabilities of 4, 8, 16 and 32 Gbps with point-and-click simplicity and enterprise-class functionality. It provides small to midsized data centers with low-cost access to industry-leading Gen 6 Fibre Channel technology and the ability to start small and grow on demand—from 8 to 24 ports—to support an evolving storage environment. IBM b-type Gen 6 Fibre Channel products are designed to unleash the full potential of new storage technologies for the new high-performance application workloads. Configurable with Ports on Demand (PoD) for 8, 16 or 24 ports and supports 4, 8, 16 or 32 Gbps speeds with proper transceivers. Includes an integrated power supply and four built-in fans. Delivers industry-leading Gen 5 and Gen 6 Fibre Channel technology in a flexible and easy-to-use solution, and is easy to deploy with the EZSwitchSetup wizard. Provides advanced 32-Gbps performance to unleash the full potential of new storage technologies for the new high-performance application workloads.